In the Western Province, where more than 60 per cent of Sri Lanka’s waste is generated, police and military will be keeping an eye on the streets for reckless garbage disposal. A team has been tasked with reporting mismanagement of garbage to the relevant authorities. Lawsuit filed by Environment Police have increased three-fold. According to the Waste Management Authority, between 7,000 metric tonnes and 7,500 metric tonnes of solid waste are generated in Sri Lanka per day. The Colombo District alone generates 2,000-2,100 MT. However, only 50-60 per cent of the garbage generated island-wide are collected by local authorities. 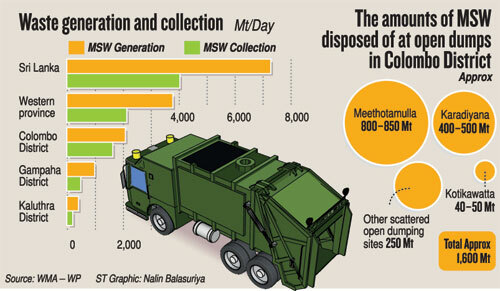 Nearly 800-850 MT of solid waste are transported to the Meethotamulla site by the Colombo Municipality Council and the Kolonnawa Urban Council. The Western Province accounts for more than 60 per cent of waste generation in the country. It will only get worse. The Ministry of Megapolis and Western Development has forecast that by 2030, the megapolis and the off-shore port city luxury residential project will generate another 1,300 MT a day. Dr Upali Indrasiri, project director of the presidential task force on environment protection, told the Sunday Times there are plans for the future. Projects to convert waste to energy will be launched in Muthurajawela, Karadiyana, and Kaduwela, Bomiriya. Karadiyana has an expected capacity of 1,000 MT per day and in Muthurajawela it will be 630 MT per day. Dr Indrasiri said discrepancies related to the feed-in-tariff rate for the generated power that caused a significant delay in the implementation of the project, has now been solved. The Bloemendhal waste site will be transformed into a mix of commercial areas, an urban forest patch, and a recreational park. A report by the Ministry of Megapolis and Western Development says that sanitary land fills will be created in Malamulla, Divulapitiya, and a bio gas project will be initiated in Dikkovita. He said about 10 MT of garbage are collected every day in the Dompe area and 3 MT were used for compost production. “One metric tonne of compost can be produced from that although sometimes it may take 2-3 weeks depending on factors such as rainfall, and humidity.” He said there was good demand for compost. “There have been instances when five MT of compost were requested at once. But our production is low.” He said that a sanitary landfill system is managed for waste that cannot be recycled or used for compost production. He said the pit has a capacity of 90 MT a day and only 10 MT of garbage is received. But he stressed that a sanitary landfill is only a short term solution. A. T. U. Kularathna, public health inspector in the Kaduwela Municipality Council, also said bio degradables are used for compost and bio-gas production while plastics, glass and polythene are recycled through machinery provided by the Central Environment Authority. “We earn some revenue from recycling and compost manufacturing. We distribute it among the workers who collect the garbage from households and companies. It is a kind of motivation for them as well,” he said. Wellawatte, Mattakkuliya worst offendersWaste collected in the Colombo Municipality area still continue to be transported to the Meethotamulla site despite public protests. The deputy director of solid waste management at the Colombo Municipal Council said 750-850 metric tonnes of waste are collected per day. Some of the waste is sold to recyclers while the rest is transported to the Meethotamulla. She said that although the garbage sent to Meethotamulla includes a large amount of organic waste, it cannot be turned into compost because there is no site for the purpose. If garbage is separated, the amount of waste collected could be reduced by 100 MT per day, she claimed. But she said there is little effort by the people to separate their waste. 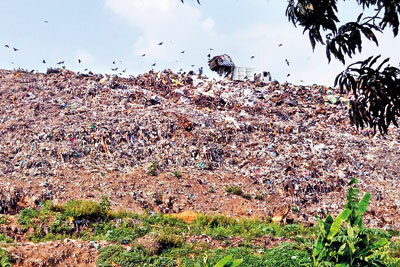 Residents in Mattakkuliya, Wellawatta and north Colombo are the worst offenders when it comes to not separating their waste, she said.